If your dog is having an extended episode, contact your veterinarian immediately. *All Information should be checked with your veterinarian. We do not intend, nor are we qualified to make medical decisions regarding your Cavalier. The most important thing to do if you feel that your Cavalier is having an episode is to stay calm and to keep your dog calm. Fear, hurry, anxiety are all things that can add to the stress of the situation and may prolong or increase symptoms. Keep a diary. Make sure you note the reason for the episode, the time of day and length of time the dog is having the episode. Also note symptoms. Grab your cell phone and take of video of your dogs symptoms so you can show your vet. One owner has discovered that if she takes a clonazepam, crushes it and rubs it on her dog's gums it shortens the episodes. Check with your veterinarian to see if you should do this. What is Episodic Falling Syndrome or Falling Cavaliers? Please see the Symptoms page. For more information please see the DNA test page of the website. Will my dog get better or worse? How do I contact you and find out other information? What should I do if I think that my Cavalier has Episodic Falling Syndrome? Remember that while this disorder is upsetting, it is almost never life-threatening. The fact that your dog is having episodes now, doesn't mean that he or she will continue to have them in the same manner. This is a disease of change and inconsistency. 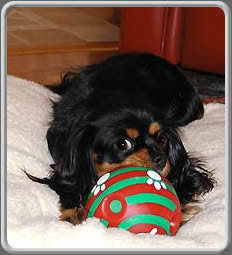 Affected Cavaliers and willing owners learn to live with EFS. Your dog will likely forget the episode as soon as it is over. While medication can mediate the severity and frequency of episodes in a lot of cases, the more comfortable you can become with episodes being just a part of life with your loveable dog, the better off you will be. Review the material here and contact us by phone or e-mail. All information conveyed to us will be kept strictly confidential. We want you to contact us. It is very important, not only for the information we can provide you, but what we can learn from you. 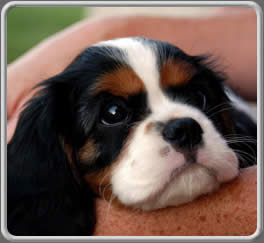 The entire purpose of this web site is to provide support and education for Cavalier owners, breeders, veterinarians, and researchers. *Contact your veterinarian. * Remember that testing will determine whether or not your dog has EFS. It will help your veterinarian make a diagnosis. If possible, take a videotape of your dog having a seizure. Write down precisely what you observe and keep a calendar of the episodes and their duration. The only way to definitely diagnose the disorder is with a videotape or direct observation in conjunction with your veterinarian. You may want to take someone with you who has seen the event. Sometimes this makes discussing things with your veterinarian easier. At the present time, three drugs are being used for Episodic Falling Syndrome. Diazepam and Clonazepam are the two main drugs. Dogs may build up a tolerance to either drug. Some veterinarians use a Diazepam drip in the event of very prolonged episodes. For dogs who are not responding to these treatments, acetazolamide alone or in conjunction with clonazepam has been effective. Acupuncture has been found to be very effective in some cases but generally requires extended treatment and cost. There is no pattern to the progression of Episodic Falling Syndrome. Episodes my increase or decrease in intenstity and/or frequency over time. Any information we could give you about the direction of the disease will only apply to an individual Cavalier and will most probably not relate to your dog's experience. A change in the pattern of episodes does not necessarily indicate that the Cavalier is getting 'better' or 'worse'. The most important thing you can do is to enjoy your Cavalier. If your Cavalier is having seizures that last for any period of time, try wrapping the dog in a light towel or a sheet and holding her reassuringly but not tightly. If your dog's legs are extending, don't try to keep them next to her body. Use a very light covering to avoid overheating. This may help both you and your dog. Do not continue this if it creates distress or discomfort in your Cavalier. If your dog cannot pant, ask your vet about putting her on a cooling mat during episodes and sit by her and talk soothingly to her. Check with your veterinarian about what food and water to give your Cavalier after an episode that lasts for more than a few minutes.& Having an episode is hard work. Dogs may overheat during episodes. This can be due to exertion combined with the inability to pant because the jaws are clenched. A "Canine Cooler" (available on-line) or other cooling device can cool down a dog during and after an episode. Check with your vet to see if he/she recommends the cooling bed during extended episodes. Getting an EFS dog used to a cooling mat early in life is a good idea. The human 'neck coolers' that are available in sporting goods stores can help. Becoming over-heated may cause episodes. Be sure that you always have water with you. Putting the dog's feet in cold water and putting something cool on her abdomen will help her cool down. Have a cooling bed on hand or use a cooling vest. If you live in a hot area, or you are for some reason need to take your dog out in unseasonably hot weather, you can purchase a cooling vest. (available at http://cherrybrook.com) I use a "Canine Cooler" cooling bed that is readily available on-line. If your Cavalier jumps off the bed or chair and trots off after having an episode, this is normal. There are no apparent after effects, although some dogs seem to have chronic symptoms such as stiffness and lethargy. If there are chronic symptoms, medication should be considered to see if it helps your dog lead a more active life. If your puppy displays fear after an episode, she will likely get used to the events as she grows and take them in stride. EFS affected Cavaliers have been known to respond to surgical procedures by a temporary increase in the intensity or frequency of episodes in some cases. We assume that the additional stress may be the cause. The costs and benefits of surgery or anaesthesia for an affected dog must be carefully considered. It is a good idea to review medications before surgery. Be sure to discuss this with your veterinarian. Good daily dental hygiene is a must for EFS Cavaliers. It can be easier if you get a good flavored dog toothpaste. Take your time to get the dog used to brushing but be firm that it get done. It only takes a few minutes a day and is well worth it both because of dental health but heart health. Be sure that your veterinarian knows that your dog has EF before any teeth cleaning procedure. 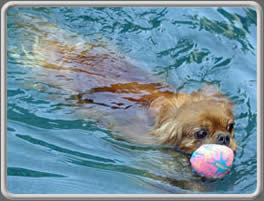 Our irrepressible Cavaliers have their own ideas about play and exercise. Generally it is not possible nor desirable to curtail their activities. However, if your dog is having repeated or very long seizures, letting her spend about 30 minutes in a quiet comfortable place for awhile, such as a crate with a favourite toy or chew stick, may help. At this point, additional stress or excitement is not advised. It is a good idea to crate train a puppy who has EFS as early as possible. Older EF dogs may retreat to their crates by themselves so be sure to have the crate open and accessible, and a cooling mat and water available. Work with your veterinarians and Cavalier clubs to learn about EF. In addition to raising awareness, this will help other owners of affected dogs. Please continue to the Contact us page.